Distribution: Open forests and heaths of south-western Australia, usually in sandy soils. Common Name: Red and green kangaroo paw. Name: Anigozanthos; uncertain origin but probably from Greek anisos, unequal and anthos, a flower, referring to the flower shape. manglesii; after Capt. James Mangles, 19th century horticultural enthusiast. Status: Not considered to be at risk in the wild. The kangaroo paws comprise a small group of 11 species in the genus Anigozanthos and a single species in the genus Macropidia. They are perennial herbs consisting of strap-like leaves arising from underground rhizomes. Flowers occur in clusters on stalks which emerge from the bases of the leaves. A number of species die back to the rhizome in summer, regenerating in autumn. All species are restricted in distribution to the southern areas of Western Australia. 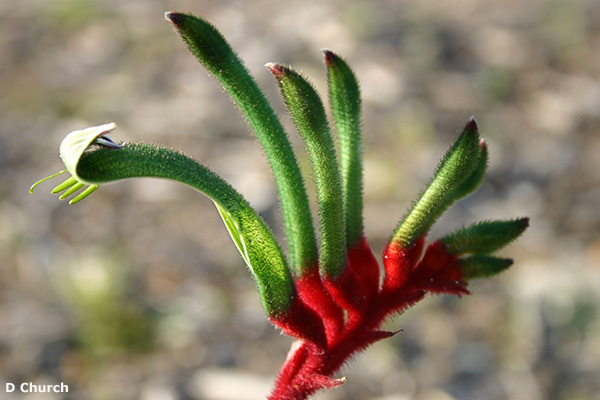 A.manglesii is the floral emblem of Western Australia and the best known member of the kangaroo paws. There are two recognised subspecies; subsp. manglesii and subsp. quadrans. The differences between the subspecies are based on growth habits and flower structures and are relatively subtle. Subsp. manglesii ranges from Gingin some 200 km north of Perth to Cape Leeuwin in the south west of the state. Subsp. quadrans occurs to the north of this range and is found as far north as Shark Bay. The red and green kangaroo paw is probably the most attractive member of the genus. It often occurs in large numbers and presents a spectacular display during the flowering season from August to November, with a peak in early spring. The individual plants consist of grey-green strap-like leaves to about 30cm in height. The hairy, bottle-green flowers occur on reddish stems up to 80cm in height. The base of an individual flower is usually bright red in colour. Each flowering stem may consist of a dozen or more flowers which open in sequence from the bottom. The flowers curve downwards as they open and the combination of the buds and opened flowers gives rise to the name "Kangaroo Paw". The flowering stems in subsp. quadrans may be branched. Although commonly cultivated, A.manglesii cannot be regarded as hardy in humid climates. In those areas it can be grown for a few years in a sunny, well drained position or in a container. In more favourable climates it is a spectacular garden plant which performs best in lighter soils, such as sandy loam. The plant is susceptible to fungal disease such as "ink spot", which is first seen as small black spots on the foliage which gradually spread and kill the plant. This is a difficult disease to control but the chance of it occurring is minimised by avoiding watering leaves or watering in the early morning so that moisture can quickly evaporate. Some hybridisation work has been carried out between A.manglesii and the hardier A.flavidus. The progeny of this work offer the potential for producing cultivars with the general appearance to A.manglesii but with greater disease resistance. One of the first of these hybrids is known as "Bush Emerald". A.manglesii can be grown from seed without any pretreatment. The species can also be propagated by division of the clump, usually after flowering. Hybrid kangaroo paws are propagated commercially by tissue culture. Further Reading: Hopper, S (1993): "Kangaroo Paws and Catspaws - A Natural History and Field Guide", Department of Conservation and Land Management, Western Australia.